Hangar tent seires adopt inflatable roof system and sandwich panel hardwall system to create a safe and comfortable location for aircraft storage and maintenance. Large side lifting door allows the entry and exit easily. 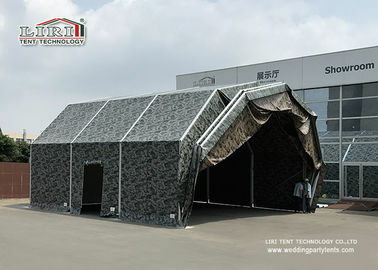 The length of the tent is 30m.The aircraft hangar tent's length can be 20m,25m,30m,35m,+times 5m. 3.1 Frame : hard pressed extruded aluminium 6061 /T6(15HW) which can last 15 to 25 years. 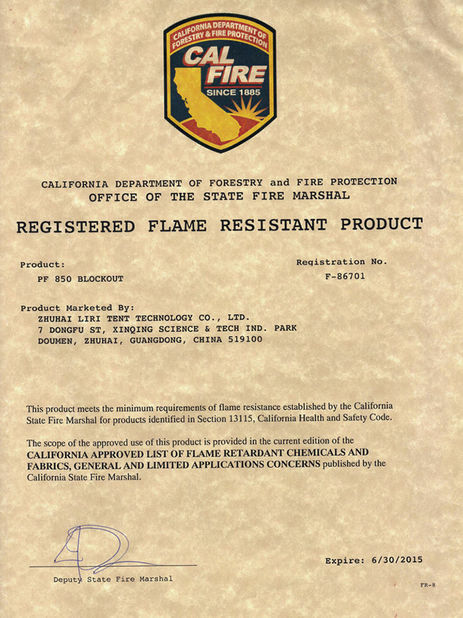 3.2 Fabric cover: high quality double PVC-coated polyester textile, 100% waterproof, flame retardant to DIN4102 B1, M2, CFM, UV resistant, tear resistant, self-cleaning ability, etc. 6.1 Ground anchor(steel peg): For soft ground surface like, earth, sand, lawn, etc. 6.2 Inflatable screw: For hard surface like, cement, stone, or prefab concrete cubic, etc. 6.3 Weight plate: For protective ground surface like marble, ceramic & tiles, asphalt, brick, etc. 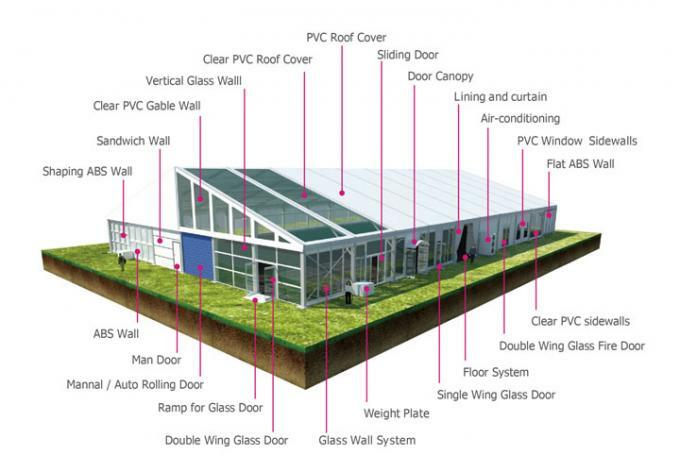 Widely used as temporary or permanent aircraft hangar tents, airport cargo,and so on. It is the best choise for the Naval Aviation and Civil Aviation using for light aircrafts. 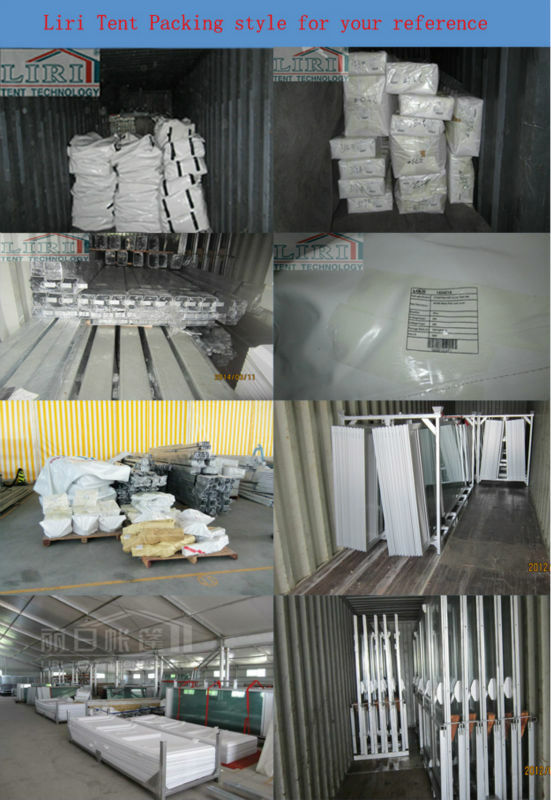 9.1 We can check the shipping price for you, and recommend shipping agents to you. 9.2 You could always arrange the shipping by your own agents. *We can help you to book hotel and tickets to make your visiting to us more convenient. *Car service, if you want to visit us and are near Zhuhai city, we can send a car to pick you up so you can come to visit Liri Tent easily. 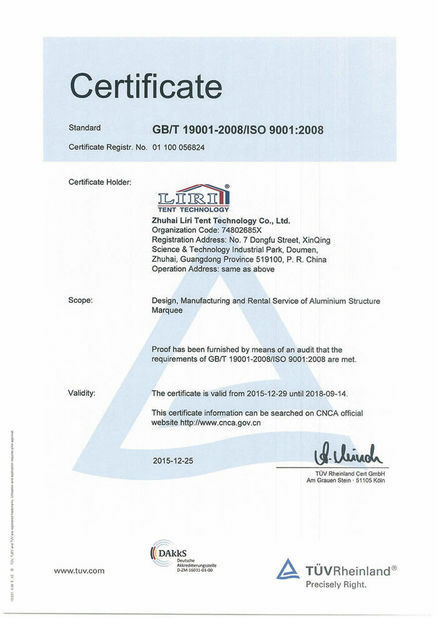 *After sale service is always available, we maintain very good reputation all over the world, and we offer after sale service to our clients, like installation instructions, replacement of flaw parts, upgrade of tents, renew tent parts, tent warehousing guidance, etc. *We can also provide furniture, lighting and specialized AC system to you.